Harold Bradley, 93, died peacefully in his sleep on January 31 in Nashville. The Tennessean reports he grew up in Nashville and played the banjo as his first instrument. He and his older brother, Owen Bradley, opened Bradley Film and Recording on Sixteenth Avenue South in 1955. Columbia Records purchased the Bradley studio in 1962. This is where Marty Robbins did most of his recording. Harold and Owen were major players in the establishment of Music Row and production of the Nashville Sound. Harold was an original member of the A-Team group of studio musicians. As a rhythm guitarist, he popularized the six-string, tic-tac style. Country Standard Time explains, “Bradley often played rhythm guitar and did many recordings with guitarists Hank Garland and Grady Martin. Garland veered towards jazzy with Martin on the funkier side. Following Garland having suffered a serious car accident in 1961, Bradley assumed lead roles.” Harold was the first president of Nashville’s chapter of the National Academy of Recording Arts and Sciences (NARAS). In 1991, he became president of the Nashville chapter of the American Federation of Musicians (AFM). He once said, “It was traumatic because I’d been working for myself since I was 15 and all of a sudden I’m working for about 3,000 people.” In 2006, he joined brother Owen in the Country Music Hall of Fame–the first musician to earn that honor. I met Harold when he came to my book release party for Twentieth Century Drifter: The Life of Marty Robbins, held at the Country Music Hall of Fame and Museum on March 31, 2012. The Grand Ole Opry will celebrate the 80th birthday of Del McCoury on February 13, with a special Wednesday night concert called “Grand Del Opry.” Bluegrass Today reports Del and his band will perform, along with guests Sam Bush, Ricky Skaggs, Marty Stuart, and Vince Gill. Del first played the Opry in 1963 as one of Bill Monroe’s Blue Grass Boys. 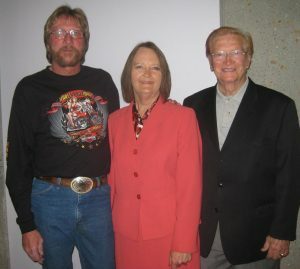 He has been an Opry member since 2003. His actual birthday is February 1. Forever and Ever, Amen: A Memoir of Music, Faith, and Braving The Storms of Life is the title of the upcoming Randy Travis memoir, co-written with Ken Abraham and scheduled for a May 14 release. This will be his life story told in his words. I’m still considering writing his biography, which would be an objective third-person telling of his life. The National Academy of Recording Arts and Sciences has announced its 2019 additions to the Grammy Hall of Fame, which was established by the Academy’s National Trustees in 1973 to honor recordings older than 25 years that are of lasting significance. Three of the 25 additions in 2019 go to “Coat of Many Colors” (Dolly Parton — 1971), “Harper Valley P.T.A.” (Jeannie C. Riley — 1968), and “Rockin’ Around the Christmas Tree” (Brenda Lee — 1958). The “dream house” of Patsy Cline has been recognized by Nashville’s Metro Historical Commission. NewsChannel 5 reports a historical marker was placed at the Nashville home where she once lived. Her friend, Jan Howard, and daughter, Julie, attended last week’s celebration to unveil the marker. The family of Doug Supernaw posted on Facebook that Doug, 58, was admitted to the hospital on January 25, suffering from pneumonia. After tests found fluid on his heart and lungs and a suspicious mass in his right lung, he was transferred to another Houston area hospital. There he was diagnosed with advanced stage-four lung and bladder cancer. Doug is currently in the hospital, waiting for more tests and a treatment plan. Two upcoming PBS projects will feature Charley Pride, the Associated Press reports. First is Charley Pride: I’m Just Me, part of the American Masters series, airing on February 22. Ken Burns’s film series, Country Music, will air in September. It tells the story of country music through the mid-1990s. More than 100 people were interviewed, including 40 members of the Country Music Hall of Fame. In addition to Pride, some of the featured artists are Garth Brooks, the Carter family, Johnny Cash, Merle Haggard, Emmylou Harris, Loretta Lynn, Willie Nelson, Dolly Parton, Jimmie Rodgers, Bob Wills, and Hank Williams. Rolling Stone Country reports that Burns will advertise Country Music by hosting a concert at the Ryman Auditorium on March 27. The show, Country Music: Live at the Ryman, will be recorded for later broadcast on PBS. Dierks Bentley, Rosanne Cash, Rodney Crowell, Vince Gill, Brenda Lee, Kathy Mattea, Ricky Skaggs, Marty Stuart, Asleep at the Wheel, and Dwight Yoakam will be some of the performers. Sunday Money, a 100-foot Hatteras yacht formerly owned by NASCAR legend Dale Earnhardt, is on the market for $4.2 million, reports Nash Country Daily. Earnhardt, who purchased the 2001 model shortly before his death in February 2001, never had an opportunity to sail it. The yacht’s name came from the title of a song he wrote with Kix Brooks, and which Brooks & Dunn later recorded for a 1995 tribute album, The Dale Earnhardt Winston Cup Collection. The yacht still has several Earnhardt accents, such as the company logo’s compass rose design, silver plates with the letter D, and a Snap-On toolbox in the engine room. CMT News reports on the speech Tim McGraw gave at the January 18 opening of his boutique fitness club, TRUMAV Fitness. “Fitness has been very important to me, especially over the last 10 years of my life,” he said. “I’ve always been an athlete, I’ve always worked out, and I’ve always tried to keep myself in some sort of shape. But over the last 10 years, it’s really been a life-changing experience for me. Certainly it’s improved my physical condition. But it’s improved, I’d say, 85 percent of my mental condition. There’s the other 15 percent that shows up every now and then that I try to fight off.” He has noticed improvements in his relationships with friends and family, as well as in his music and his career. The FBI has concluded its investigation into the Route 91 Harvest Festival mass shooting in Las Vegas that left 58 people dead and more than 500 injured on October 1, 2017. Nash Country Daily reports that the Las Vegas Review Panel (LVRP) found no clear motivating factor for the attack or any evidence of ideological or political motivation. The shooter acted alone. The LVRP concluded that he intended to die by suicide, and he wanted to attain infamy via a mass casualty attack. Adrian Pasdar, 53, estranged husband of Natalie Maines of the Dixie Chicks, is seeking $60,503 in monthly child/spousal support, along with $350,000 for attorney fees. PEOPLE obtained court documents in which Pasdar claims that Maines, 44, is worth $50 million, makes $2 million a year, and can be expected to net millions from her upcoming 2019 tour. He says he gave up “countless employment opportunities” to stay with the children while she traveled. She filed for divorce in 2017, after 17 years of marriage, citing irreconcilable differences. He moved out of their $12 million Los Angeles home and into a $7,000-monthly rental. He is a working actor who averages $150,000 per year and has gone $200,000 in debt since their split to support himself and their two sons, ages 14 and 17. He challenges the validity of their prenuptial agreement, calling it “unconscionable” under the circumstances. She says he is trying to drag out the divorce, which costs her both money and time. Ole Red has become one of Nashville’s most popular honky-tonks since Ryman Hospitality, in partnership with Blake Shelton, announced plans in 2017 to invest $20 million to renovate the Lower Broadway building constructed in 1926. About the same time, the Metro Historic Zoning Commission passed a policy to ban colored exterior lights in districts with historic overlays. This week, the Commission filed a lawsuit against Ryman Hospitality for violating that policy. The exterior of the Ole Red is bathed in red light at night to match the honky-tonk’s theme. The Commission is seeking an injunction to force Ryman Hospitality to correct the lighting issue. According to The Tennessean, Lower Broadway honky-tonk owners have complained in the past that the Commission overreaches its enforcement authority in the historic district. When the Music Modernization Act was signed into law last year, one of its most important components was the creation of a licensing group to handle digital licensing for songwriters and publishers; it will oversee tens of millions of dollars in digital mechanical royalties annually. The Tennessean reports a joint proposal by the nation’s three largest publisher/songwriter trade groups to operate that new licensing organization: The National Music Publishers Association, the Nashville Songwriters Association International, and the Songwriters of North America. Press releases announced the board members and expressed “broad support from virtually every major music industry company and trade association.” Other groups are also applying for the right to operate the licensing organization. Kirt Webster was a prominent country music publicist in Nashville when claims of abuse and sexual misconduct forced him to close Webster Public Relations in 2017. Dolly Parton, Kid Rock, and Charlie Daniels had been some of his many clients. He was never charged with a crime. “Contrary to speculation, I have never gone anywhere,” he told The Tennessean this week. “I am alive and still living in Nashville, Tennessee. I am blessed to have many friends in the music business, many whom have opened their hearts and businesses to me.” He has launched a new website that says what’s next for Kirt Webster “will be visionary, unexpected, larger than life, and filled with newsworthy answers to that very question.” Things and projects are happening already. Linda Ronstadt appeared on CBS Sunday Morning on February 3. She described noticing something wrong with her voice in 2000. When she tried to sing at her concerts, she could only yell. She retired from performing in 2009 and was diagnosed four years later with Parkinson’s disease. She hopes for a cure for the disease. “I’m sure they’ll find something eventually,” she told the interviewer. “If not, I mean, I’m 72. We’re all going to die. So, they say people usually die with Parkinson’s. They don’t always die of it because it’s so slow-moving. So, I figure I’ll die of something. I’ve watched people die, so I’m not afraid of dying. I’m afraid of suffering, but I’m not afraid of dying.” This week, she is releasing her first-ever live album, Linda Ronstadt Live in Hollywood. It includes 12 songs from a 1980 concert. Diane: Mary Kay James was born Mary Kay Mulkey in Atlanta, Georgia. She had four releases in Billboard’s Top 100 in 1974-75. Several of her 45s are on YouTube and eBay. The only current information I could find was a two-year-old comment that she lived in Georgia and was singing Country Gospel. Readers? Does anyone know Mary Kay James? Johnny Russell called me in May 2000, in response to my request for an interview about Faron Young. Johnny was on dialysis at the time. If I remember correctly, his legs had already been amputated below the knee, as a result of diabetes. He died in 2001 at age 61. When he made the movies, he worked in Fresno. He and Hubert Long came from Hollywood. They rented a car and they drove up to Fresno, and they were tired, and they had to get back to LA for something. So they took the train, and got them a sleeper on the train, and me and a friend drove the car back to LA for them. You couldn’t drop cars off then. They had to get the car back to LA. We got to the Hollywood Knickerbocker just in time to take them to the airport to put Faron on the plane. Hubert was walking out to get a cab just as we pulled up. Faron came on out, and we went to the airport. I had been to Nashville, and I went back to Fresno. I was 18-19 years old. Faron came back from Nashville to do a show at the auditorium. This friend of mine, who was another musician, came over to my house. He said, “Are you gonna go see Faron Young tonight?” I didn’t know Faron that well, but I was acting like I did. This guy said, “Man, you don’t know him.” I said, “Yeah, I know him real well. I’ve been to Nashville and we got to be good buddies in Nashville.” Really building it up. “As a matter of fact, I gotta call him and go have lunch with him.” He says, “Yeah, I bet. Why don’t you call him now?” So I went in the bedroom and I called the motel where I knew he was staying, and I got through to him. I reminded him who I was, that I’d been the one to take the car down to LA. He said, “Yeah, I remember.” I said, “I got this friend that don’t think I know you. If I come out tonight, act like you know me, okay?” He said, “Why don’t you just come on over to the motel and bring him with you?” I said, “I don’t want to bother you, man.” He says, “Naw, bring that SOB out here.” I went back in there and I told him, “He wants us to come out and have lunch with him.” He said, “You’re kidding!” We went out to the motel where he was. He had the door wide open, we walked in, and he was shaving. He came over and hugged me, and said, “I didn’t know how to call you. I’ve been wanting to call you, make sure I was going to get to see you while I was here.” He said stuff like, “Tubb told me to be sure if I saw you to tell you hi.” I didn’t know Ernest Tubb at that time. But he would do stuff like that. I ran into Faron somewhere, and they were going barhopping. I’ve never drank. These guys that were with him were friends of mine, and so I went along with them. We went in this one place that had a room with a pool table in it. He loved to play pool, and he was drinking, and he was bragging. He got to playing pool with this guy and they got to arguing about who was the richest. Now Faron had never seen this guy before. He didn’t know who he was, didn’t know what he did. There was a possibility the guy was an oilman from Texas, and extremely rich. But Faron was convinced he was richer cuz he was Faron Young. They got to arguing, and I don’t remember which one of us said, “Let’s get out of here. This is getting ridiculous.” We went out on the porch, stood out there, and realized Faron was not with us. We stood there for a little while and he didn’t show up. So we walked back in to the room with the pool table. The guy had him down on the floor, holding his head in his arm, hitting him in the head with a cue ball. When we walked in, Faron looked up at us, and he said, “Will somebody do something?” We finally got the guy off of him, and Faron was bleeding. We insisted that Faron go to the hospital. One time I was riding on his bus. We were gonna do a show right outside of Pittsburgh. He had asked me to ride up on the bus with him. I said I would, although I kinda–you get worried because you know that it was an overnight trip, and somewhere on that trip, he’s gonna get drunk. And he wasn’t very pleasant to put up with sometimes when he was drinking. He got drunk before we got there. Went to bed and woke up perfectly sober. No hangover or anything, just in great shape. On the way up there, we got to playing Trivial Pursuit–that’s when that game was really popular. And he won every time. It amazed me what he knew. He knew everything, it seemed like. He was very, very smart. I was on a plane, coming from Lubbock, Texas, to Nashville. Faron got on the plane in Dallas, and Faron was already drunk. I remember the stewardess had an apron on, and he put his hands in the pockets of that apron. She said, “Sir, you get your hands out of there, and sit down, or you’re going to be thrown off this plane.” He looked over and saw me. He said, “Well, I’ll just sit here with the fat boy.” They got the door closed and we were taking off. I was getting a divorce at the time, and he said, “What’s this I hear about you getting a divorce?” We were sitting in first class, and he was talking loud, and everybody could hear. I said, yeah, trying to be quiet. He said, “You ain’t gonna do it. When we get back to town, you and I are going out to your house, we’re gonna talk to Linda, and we’re gonna work it out.” I said, “Faron, we already worked it out.” He said, “What are you gonna do about them kids?” I said, “The kids gonna live with me.” “Nah, we’re all gonna work it out.” Then he got to talking about his and Hilda’s relationship. It was like I wasn’t even part of the conversation anymore. He had just drifted off and was reliving their relationship. So when I found out he and Hilda were getting a divorce, I called him. I said, “Oh, no, we’re going out there, and you and I are gonna sit down with Hilda, and we’re gonna work it out.” He said, “Russell, that ain’t funny.” I said, “I know that ain’t funny, Faron, but I’ve been through it with you.” And he hung up. The last time I remember seeing him, we worked a date somewhere up in Illinois. It was an outdoor thing, and they had a bunch of stages set up. It was a town celebration. We were all on different stages, but I think Faron and I were on the same stage. He sent somebody over to get me. I was on my bus, and somebody came over and said he wanted to talk to me, so I went on over and got on the bus with him. He asked me how I’d been doing–I’d been sick or something, maybe it wasn’t long after my open-heart surgery–but he was concerned about how I was doing. That’s when he told me he was gonna quit. He said, “I got all I need. I can make it the rest of my life. I’m just tired. I don’t want to do it no more.” I didn’t believe him. But that may have been his last date. I know it was pretty close to it. Moe Bandy has been one of my favorite singers ever since he came on the scene in the early 1970s. So I was happy to get a copy of Moe Bandy, Lucky Me: The Autobiography, written in 2017 with Scot England. I enjoyed reading about his life and all the songs so familiar to me. Although born in Mississippi while his dad was in the U.S. Navy, Moe grew up in Texas. He’s lived in Branson ever since he opened the Moe Bandy Americana Theatre in 1991. My first time to see him in concert was at his theatre in 2006. I bought a greatest-hits CD that I listened to non-stop during my several-hour drive to Kansas. I highly recommend this book. Here’s my recent review. This entry was posted on Wednesday, February 6th, 2019 at 9:41 am	and is filed under Newsletter. You can follow any responses to this entry through the RSS 2.0 feed. Both comments and pings are currently closed.